Interested in a smart and efficient SUV with flexible seating and cargo storage for your active lifestyle? The 2016 Honda CR-V and 2016 Toyota RAV4 offer consumers exciting options for an afforadable price tag. Take a look at these two popular 5-seater, 2-row SUVs as we compare their overall features, specs, fuel efficiency and price. Both popular compact SUVs, the CR-V and RAV4 offer on-the-road versatility and cargo carrying options with many similar standard features on all models, like hands-free Bluetooth, MP3/WMA Playback, USB, 60/40 Split Folding Rear Seat, Power Windows, Remote Entry System, A/C, and many more. While both SUVs offer a backup camera standard on all models, the 2016 Honda CR-V includes a Multi-Angle Rear View Camera with Guidelines, showing three distinct angles: normal, top-down, and wide, for greater driver visibility. In addition, the CR-V’s standard audio and connectivity options on all models include Pandora® compatibility, which for the RAV4 is only available on an upgrade to the XLE models and above, as well as SMS Text Message Function on all Honda CR-V models, but is not even listed as available on the RAV4. A smoother, more striking appearance, the 2016 Honda CR-V rises above the competition in many areas, praised by Kelley Blue Book for its “enviable resale value” and “overall excellence with the prestigious Best Buy Award,” naming it for the third year in a row in the KBB 16 Best Family Cars of 2016 (the Toyota RAV4 didn’t make the list). 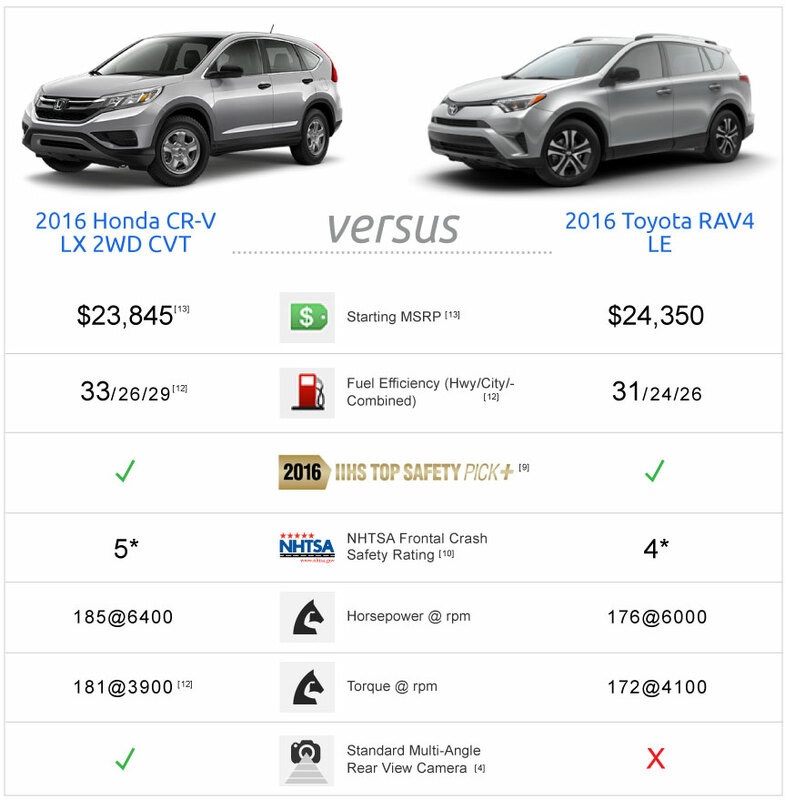 Both rated from the International Institute for Highway Safety as 2016 IIHS Top Safety Pick+ vehicles, the 2016 Honda CR-V and 2016 Toyota RAV4 both also received 5 stars in Overall Crash Test Ratings from the National Highway Traffic Safety Administration (NHTSA), although the Toyota RAV4 only received 4 stars in both Frontal Driver and Frontal Passenger Crash Ratings, as compared to the CR-V’s 5 stars in both of these categories, making the CR-V a smart, safe choice for you and your passengers. This Honda CR-V also excels in the following two categories very important to compact SUV drivers: spaciousness and fuel economy. Both offering flexible cargo carrying options using the cargo storage area, 60/40 split folding rear seats for additional storage options, and versatile seating for 5, the Honda CR-V passenger volume beats out the competition at 104.1 ft3, as compared to the Toyota RAV4’s 100.7 ft3. As shared by The Car Connection (TCC), “Today’s CR-V is one of the most spacious vehicles in its class, and one of the more fuel-efficient ones, too.” That being said, the CR-V is rated for up to 26 City / 33 Highway / 29 Combined MPG, while the Toyota RAV4 is only rated for up to 24 City / 31 Highway / 26 Combined MPG (excluding Hybrids), making the CR-V a wise choice for both interior spaciousness and fuel efficiency. When comparing performance, the 2016 Honda CR-V continues to shine, bringing you more horsepower at 185@6400 rpm versus the RAV4’s 176@6000 rpm, and more torque at 181@3900 rpm versus the RAV4’s 172@4100 rpm. In addition, the CR-V comes with Continuously Variable Transmission (CVT) with Sport Model, standard on all CR-V models, or a Real Time All Wheel Drive with Intelligent Control System™ as an available option for all trim levels, while the Toyota RAV4 requires you to upgrade to at least the XLE model for either functionality. So… the 2016 Honda CR-V is more spacious, has better fuel economy, more horsepower, more torque, better transmission options for all models, and is more highly awarded by KBB and U.S. News. Yes, but what’s the cost? Amazingly, you can enjoy the 2016 Honda CR-V for a slightly lower starting MSRP of only $23,845 as compared to the Toyota RAVs starting MSRP of $24,350, making the CR-V clearly a smarter choice for both your budget and your active lifestyle in and around Rochester and beyond. Explore the 2016 Honda CR-V Now! All information presented on this page was obtained directly from www.Automobiles.Honda.com, www.Toyota.com, IIHS.org, SaferCar.gov, and www.TheCarConnection.com. Information is deemed to be accurate but cannot be guaranteed. Consumers are welcome to independently verify all facts against manufacturer data and to contact us with any questions, using the form on this page. The 2016 Honda CR-V with Honda SensingTM has been awarded the coveted 2016 TOP SAFETY PICK+ rating from the Insurance Institute for Highway Safety (IIHS) in recognition of their superior crash safety performance. For more information, visit: http://www.iihs.org. Government 5-Star Safety Ratings are part of the U.S. Department of Transportation’s New Car Assessment Program (www.safercar.gov). Model tested with standard side airbags (SAB). For more information, visit: http://www.safercar.gov.